This is a sweet which was traditionally served at weddings or festive lunches. 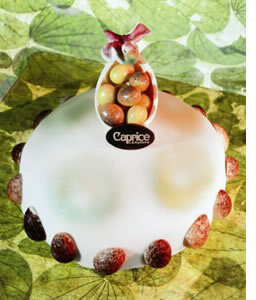 The liqueur soaked slices of sponge cake are filled with three different creams: egg, chocolate and almond. 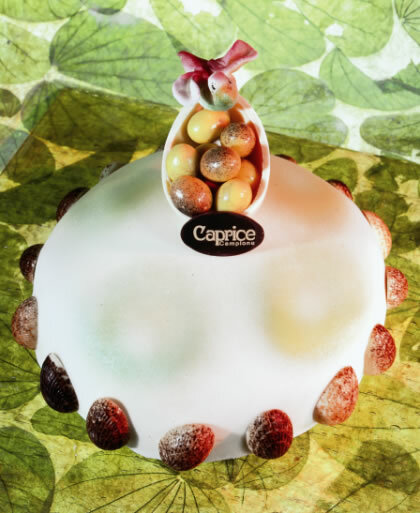 When the cake is coated, it is decorated with colouredcandies. Whip the egg yolks with the sugar, add the flour and dilute with milk. Add the lemon rind and mix on the heat until thick. Prepare a syrup bringing to boil sugar and water for several minutes. Mix the peeled and minced almonds with the syrup. Combine the grated lemon rind. In a side, with the half of the hot custard, melt the bitter cocoa with the sugar and a bit of cinnamon. Cut the sponge cake in 4 discs and, on the first disc, which is wet but not soaked with Alkermes, diluted with milk, place the other half of custard. On the second disc, also wet, go on with the almond royal paste; on the third disc, spread the ½ litre of chocolate cream. Finally, the fourth disc is covered with almond paste. Garnish at pleasure, putting the coloured candies.